He was born in Fort Yates, ND, on the Standing Rock Reservation in 1949, and is an enrolled member of the Hunkpapa Lakota the same tribe and reservation as the great medicine man Sitting Bull. He learned the basics of his art from his former wife. Halsey uses traditional methods to make clay sculptures. 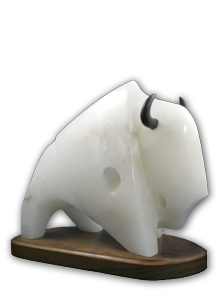 However, instead of making pots, dishes and other typical Pueblo art pieces, he creates human and animal forms including buffalo, bears and eagles. Each sculpture seems to rise out of the earth. The Santa Clara Pueblo technique taught to him by his ex-wife is difficult to master. Each step is a painstaking accomplishment in itself. It takes years of experience to skillfully turn these sculptures in to art. Halsey’s work continues to evolve. “Patience, endurance and humility are needed to learn and apply the skills involved in realizing a successful end product. Although the techniques are difficult and precise, clay sculpture is a healthy, soothing way to satisfy creative desires and stay in touch with our Grandmother Earth,” the artist said. The sculptor molds his creation by hand then hollows the forms so the surface and interior will dry and fire fast and evenly. The surface is then sanded. The next step is called “stone-polishing.” The piece is rubbed with a polished stone until it takes on a smooth and polished glow of its own. The final step is the firing process. Through the use of common material such as tree bark and animal dung, Halsey is able to vary the color of his sculptures from the traditional Santa Clara red and black to white, brown, ebony and other contemporary colors. The firing process makes the clay durable and makes the polished surface permanent. “Since these are low-fired pieces, when you clean or wipe them, use a dry cotton cloth, never wipe with a wet cloth. People always say they like the feel of my work. I tell them they are touching our Grandmother Earth. She is the womb where we all come from and where we all return. I am just returning my appreciation through my work. I am thankful for being able to create something from a piece of Grandmother’s crust,” Halsey said.